Bubbles Blinds - Curtains/Blinds/Shutters based in Eastbourne, East Sussex. 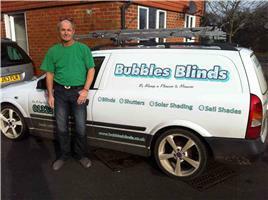 With over 10 years experience in the blinds industry I started Bubbles Blinds in May 2007. I offer a home service, bringing my "showroom" to your home, allowing you to relax and choose your style of blind in the comfort of your own home. I offer a full range of blinds including verticals, aluminium Venetians, wooden Venetians, rollers, Romans, woodweave, pleated, "perfect fit", velux etc. I also offer plantation shutters, insect, solar and privacy screens,shade sails and solar control inserts for conservatory roofs. I offer quality blinds at very competitive prices. "IT'S ALWAYS A PLEASURE TO MEASURE".